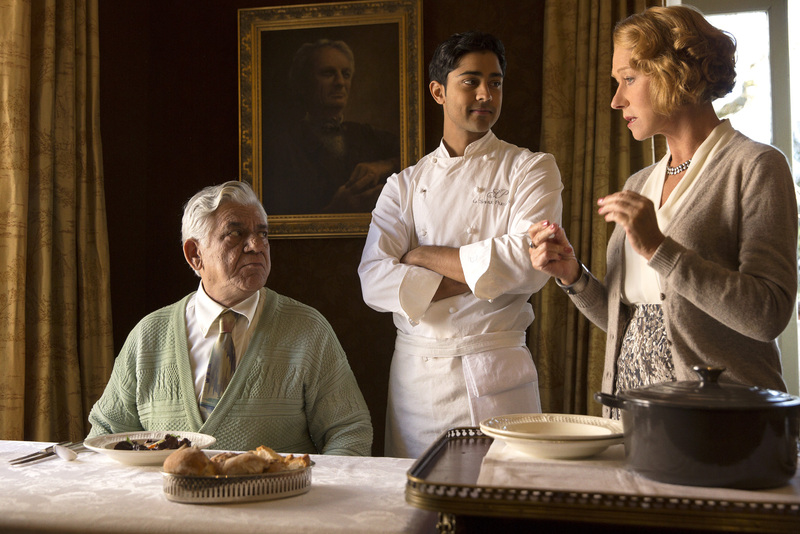 Film Review: ‘The Hundred Foot Journey’! Other than love what is the universal language…food. Everyone needs to eat, but there are those that celebrate food. With so many different kinds of food, tastes, ways to prepare food around the world, it still astounds me that the world is not more united. The Hundred-Foot Journey is a step in that wonderful direction. Hassan Kadam (Manish Dayal) lives for cooking. His mother taught him how to smell, taste, and prepare the ingredients. The traditional culinary masterpieces drew crowds to their family restaurant, which was the best in town. After some sort of election, the restaurant was burned down due to riots. Hassan lost his mother in the fire. This horrific event propelled the remainder of the family from Mumbai in search of a new home. Hassan’s father (Om Puri) decided to move the family to Europe. They tried London, but the city literally rained on their parade. Next stop is the South of France. While driving through the countryside, their vehicle breaks down. Along comes a Good Samaritan, Marguerite (Charlotte Le Bon). Marguerite tows the Kadam family ‘s vehicle to her village. Papa Kadam notices an abandoned restaurant while the family pushes the vehicle through the town on their way to the auto garage. Marguerite takes them home and introduces them to French cuisine in a bevy of fresh delights. She bakes her own bread; her uncle presses olives to make the savory olive oil, etc. The food is so vivid in the film that you forget the people in the background. Marguerite is a sous chef at Le Saule Pleureur owned by Madame Mallory (the infallible Helen Mirren). Le Saule Pleureur is the only restaurant in town and it just so happens to be across the street from the rundown restaurant that Papa saw on the way. 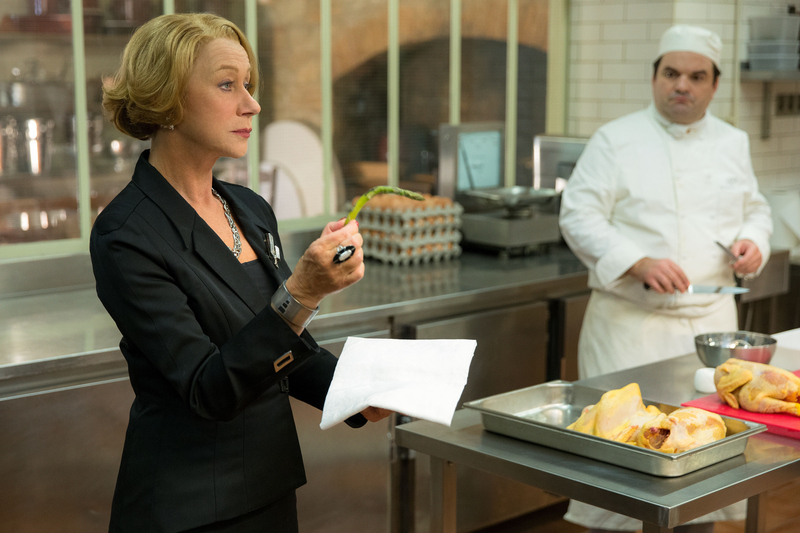 Madame Mallory runs the restaurant with the iron hand that has made audiences fear and respect Mirren for years. She sits down her entire kitchen staff that is mortified into stillness. Slowly and decisively Madame reveals the reason of the meeting, a piece of limp asparagus that was served the previous evening. Every chef wants to work for Madame Mallory and few are honored with the privilege. Papa decides that the family has found their new home and purchases the restaurant. Despite Le Saule Pleureur’s monopoly and the fact that the people of the village have never eaten Indian food, he is sure that their restaurant will thrive. Especially since Hassan’s cooking is extraordinary. Maison Mumbai is born (clever name since Maison is French for home and Mumbai was the home of the Kadam family). There’s just one more obstacle in their way, Madame Mallory. So, the war begins. The beginning was a little abrupt with Hassan being held up by customs in what we later discover is France. Mirren’s performance is flawless. Madame Mallory kind of reminds me of another role Mirren played, Mrs. Tingle, in Teaching Mrs. Tingle. She has an amazing ability to shift on the audience without them noticing. One minute you despise the next she is your hero. Film newcomer Manish Dayal has real potential. He comes across as the sweet, shy boy next door. However, when he turns on the charm, you see a man. His performance is seductive even at his most humble moments. Overall, The Hundred-Foot Journey is a delightfully endearing film about family. This entry was posted on Saturday, August 9th, 2014 at 8:25 am	and is filed under Film, News. You can follow any responses to this entry through the RSS 2.0 feed. You can skip to the end and leave a response. Pinging is currently not allowed.